The huge shire horse descends from the medieval Great Horse, the charger that knights rode into battle. By the 19th century, these giants were served primarily as freight haulers during Britain's industrial revolution. The breed standard permits colors of black, gray, bay and brown, but the occasional chestnut shire appears. Shires have the strengths and weaknesses of any draft breed, with some issues particularly affecting them. If you're looking for a working horse, it's hard to beat the shire for strength and work ethic. He learns easily and wants to please. This draft horse, primarily serving inr driving or plowing, is suited to training as a riding horse. Properly conditioned, he can work long hours in the field, on the road or under saddle. Shires generally like humans and possess good temperaments. Such large horses must be docile, as they would otherwise be quite dangerous to handle. Shires possess patience and don't spook easily. This is the breed that pulled omnibuses in major cities before the advent of the automobile. Not much surprises them, and they can deal with the kind of stimuli that would cause a meltdown in less calm equines. 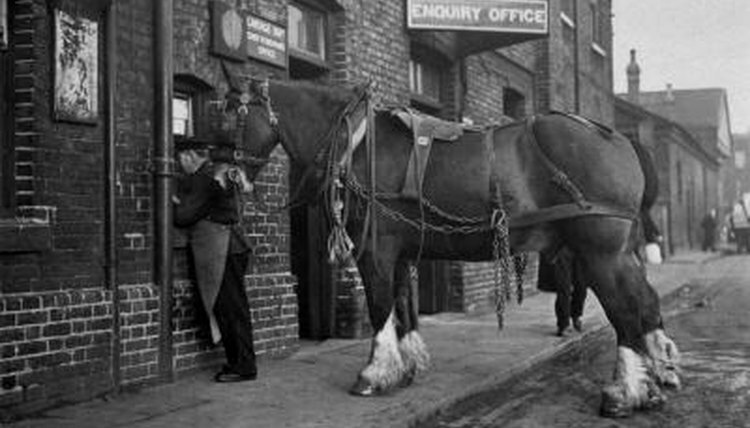 Draft horses such as the shire cost more to feed and shoe than "light" horses -- often a lot more. At maturity, a shire weighs 2,000 pounds or more. A light horse may weigh half of that. In fact, the shire is the largest of the draft breeds, according to the Rare Breeds Trust of Australia. The breed standard requires a minimum height of 16.2 hands full-grown; many reach 19 hands or more. Because of his size, you might need to purchase custom-made tack for your shire. Their relative rarity also makes a shire more expensive than more common horses. Although the number of registered shires is increasing, the breed almost became extinct in the United States. According to the American Livestock Breeds Conservancy, the U.S. shire registry ceased operations from 1955 to 1961, but after that a slow but steady revival took place. If you want to purchase a shire, it could take more time and travel than with more common draft breeds to find the right animal. Like other draft breeds, shires are prone to polysaccharide storage myopathy, a neuromuscular disease that causes hind leg spasms. Your vet might recommend a high-fat diet to avoid this problem. The shire's heavily feathered legs require a great deal of upkeep to keep clean. Because of the feathering, shires often suffer from the bacterial infection colloquially known as "mud fever," "scratches" and "dew poisoning." While topical treatment or antibiotics can help, keeping your shire out of wet areas reduces the odds of his developing this dermatological disease.